The Yankees announced special holiday on-sale opportunities exclusively for Mastercard cardholders to purchase tickets for select 2019 New York Yankees home games. Starting at noon ET on Thursday, November 15 and continuing through 10:00 p.m. on Monday, December 24, fans using their Mastercard may purchase specially priced individual game tickets to select 2019 Yankees home games as part of the "Mastercard Preferred Pricing" program, which offers discounts to select games in select seating categories when purchasing tickets using a Mastercard. Select Mastercard $5 Games and Half-Price Games noted below will also be available for purchase during this on-sale offer. Additionally, from noon ET on Thurs., Nov. 15 through 11:59 p.m. on Cyber Monday, Nov. 26 only, there will be a special “Buy 2, Get 2” offer. Fans can save up to 50 percent off select seats with this program by using their Mastercard and the code MCB2G2. The “Buy 2, Get 2” offer is valid for eight games during the 2019 season. Fans interested in taking advantage of the above special single-game Mastercard on-sale programs may purchase tickets by visiting www.yankees.com/priceless or www.yankeesbeisbol.com, or by calling Ticketmaster at (877) 469-9849 or (800) 943-4327 (TTY). These on-sale opportunities will not be available at the Yankee Stadium Ticket Office or Ticketmaster outlets. Existing Yankees Season Ticket Licensees using their Mastercard will have special advanced access to all of the above ticket specials during an exclusive pre-on-sale from 10:00 a.m. to noon ET on Thurs., Nov. 15. 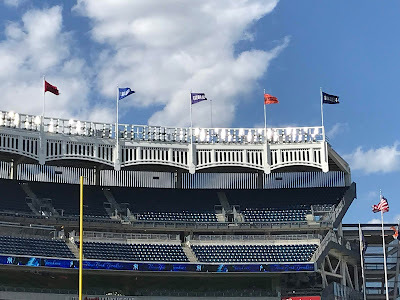 In a continuing effort to provide Yankees fans with an increased number of value-price single-game ticket options, the Yankees will continue to offer a $15 Pinstripe Pass ticket and a $10 Grandstand Level ticket. These two single-game ticket offers will be available for the game dates included in the Holiday Ticket On-Sale presented by Mastercard. About the Pinstripe Pass in 2019: Starting at $15 and available for all 2019 regular season home games in future on-sale events, the Pinstripe Pass ticket is a general admission standing room only ticket which also includes one drink (choices include a 12 oz. domestic beer for those age 21 and over with a valid government-issued ID, a Pepsi product or a bottle of Poland Spring water). Fans purchasing a Pinstripe Pass will be able to enjoy the game from non-assigned standing room locations throughout the Stadium or at any Yankee Stadium social gathering location, including the Mastercard Batter’s Eye Deck, Frank’s RedHot Terrace and the Toyota Terrace, as well as the Budweiser Party Decks and AT&T Sports Lounge (featuring DirecTV service). Pinstripe Pass quantities and starting prices will vary for each game. For more information regarding the Pinstripe Pass, please visit www.yankees.com/pinstripepass. About $10 Grandstand tickets in 2019: For every 2019 regular season home game, the Yankees will offer $10 Grandstand Tickets in select Grandstand locations in future on-sale events. Quantities will vary for each game. Details and game dates for Senior Citizen Games, Student Games, Youth Games and Military Personnel Games will be announced in the future, as will the 2019 promotional item giveaway schedule. Additionally, information will be released regarding the on-sale of all other individual game tickets. All individual game ticket prices are subject to variable and dynamic pricing, which provide fans with more price options based on changing factors that affect market demand. In an effort to better accommodate the varying needs of our fans, select Mon.-Thurs. home night games in April, May and September will begin at 6:35 p.m. (instead of 7:05 p.m.). This initiative, which began in 2018, continues the Yankees’ ongoing efforts to improve the fan experience for every guest at Yankee Stadium. Yankees season ticket plans, starting as low as $90 per plan, are now on sale. For complete season-ticket information, please visit www.yankees.com or www.yankeesbeisbol.com, contact the Season Ticket Sales and Service Department via e-mail at seasontickets@yankees.com or call (212) YANKEES [212-926-5337]. For assistance with purchasing group tickets for individual games during the 2019 regular season, a Yankees group sales representative can be reached at groups@yankees.com or by calling (212) YANKEES [212-926-5337]. Individual-game suites are available by contacting the Yankees Premium Sales and Services Department at premium@yankees.com or (718) 508-3955. Books: Bill Nye's "Everything All At Once"
Books: Arne Duncan On "How Schools Work"